The iconic venue will reopen to the public from 9.30am on Saturday, December 8. 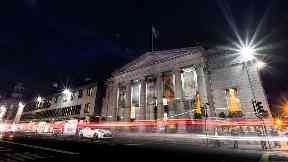 Aberdeen Music Hall will reopen its doors after a multi-million pound transformation. The £9m project, which has seen the arts venue close to the public for two years, will reopen on Saturday with a community celebration called Stepping In. The 200-year-old building has undergone extensive excavations to create a new lower ground floor, freeing up space for a new performance studio, new creative learning studio, new cafe bar, restaurant and relocated box office. The entrance to the Music Hall has been also been transformed with a floor-to-ceiling video wall exhibiting digital art. To celebrate the venue's grand reopening, Travis frontman Fran Healy will lead the Music Hall community choir in a performance of hit single Sing on Saturday. The venue will be opened to the public from 9.30am with free entry all day. The day will feature performances and activities from local communities who have been participating in the award-winning Stepping Out programme during the Music Hall's closure.